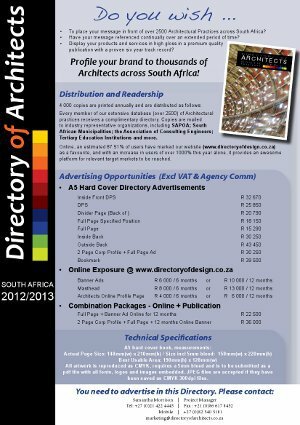 Reygan Media are the publishers of the annual ‘Directory of Architects South Africa’, as well as the web site www.directoryofdesign.co.za. They have recently embarked on an exciting new relationship with the Kitchen Specialists Association of South Africa and are very pleased to be able to offer KSA members an opportunity to further increase the reach of their brand into the local design and built environment industries. For the 2012/2013 edition they will be running a fair amount of editorial on issues pertaining directly to the kitchen industry and will feature extensive contribution from the KSA themselves. KSA members will be entitled to a reduction of 15% on any of their standard advertising rates; a free copy of the publication will be mailed to members and should members advertise in the Publication, they will also receive three months online exposure on www.directoryofdesign.co.za free of charge. Directory of Architects will be featured at Decorex this year and will also be distributed to the members of the Institute of Interior Design Professionals (IID). With a readership as extensive as theirs members would do well to be placed in this publication. Please contact Heloise 021 422 4445 or mail her at marketing@directoryofarchitects.co.za to take advantage of this offer now!